Unsure of which child care provider will be the best match for you and your child? At Tender Years, we understand that choosing the right curriculum-based child care for you and your child can be difficult. That’s why we’re proud to offer an industry-leading 30-Day Money-Back Guarantee that we call our Perfect-Match Pledge. . .
It’s simple. If after 30 days, you don’t feel that Tender Years is the perfect match for you and your child, we’ll happily refund your tuition. We pride ourselves on our family-like environment. It’s our top priority to make sure that the families and staff here at Tender Years all feel like part of our family. And that’s why we offer such an unprecedented guarantee. Because your perfect daycare is about more than just a great early-education curriculum, impressive staff credentials and tenure, the facility’s amenities, or a good value. It’s about feeling at home, feeling comfortable, and feeling confident that your child will be genuinely cared for. … And the best way to know if you feel at home here is simply to try us – Risk Free! 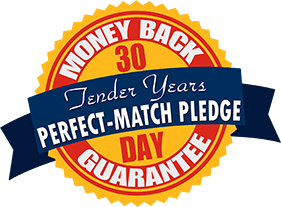 • The Pledge is available to families who have not previously enrolled a child at Tender Years, Inc.
• A newly-registered family is eligible for one tuition refund – on one child only. • All enrollment paperwork must be submitted prior to the first day of attendance. • During the first four weeks, the child must be in attendance at least 80% of the time they are enrolled for. • The Pledge applies only to tuition fees paid within the first 30 days of enrollment (the “Pledge Period”). Any fees beyond tuition, such as registration and supply fees, are non-refundable. • The Pledge does not apply to enrollments for Summer Camp, Before & After School Programs, and Part-Time Programs. • Families must notify the center’s director, in writing, of their intention to withdraw their child. This notification must be submitted before the end of the 30-day trial period, accompanied by the reason for the dis-enrollment. • Upon the above qualifications being met, Tender Years, Inc. will reimburse the full tuition amount paid during the Pledge Period within 30 days of the school’s receipt of the notification of dis-enrollment.